Music legend and master of it all, Pharrell Williams needs little introduction. Most of the time, he doesn’t even need a last name. Although most recognised for his work in the music industry, his role as a multi-talented artistic savant has deeply entrenched him within the world of fashion as well. Aside from a long-standing partnership with adidas, he has modelled for Chanel, designed shades for Louis Vuitton, co-owns G-Star RAW and co-founded Billionaire Boys Club. Over the weekend, he launched his newest collaboration with adidas Originals for AW17. Just in time for the US Open, the tennis collection includes a line of men’s and women’s clothing and footwear. 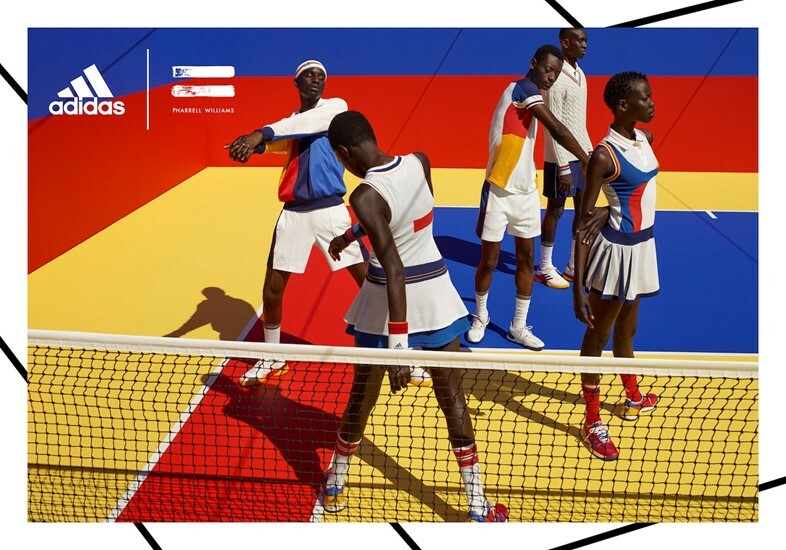 With the overall aesthetic harkening back to the 70s golden age of the sport – when players graced the courts with a certain ethereal grace and je ne sais quois – Pharrell lends his sophisticated-cool medley of swagger and style to the brand. In conjunction with a New York City-wide campaign called ‘Don’t Be Quiet Please’, Pharrell’s launch includes a manifesto for social change and activism. 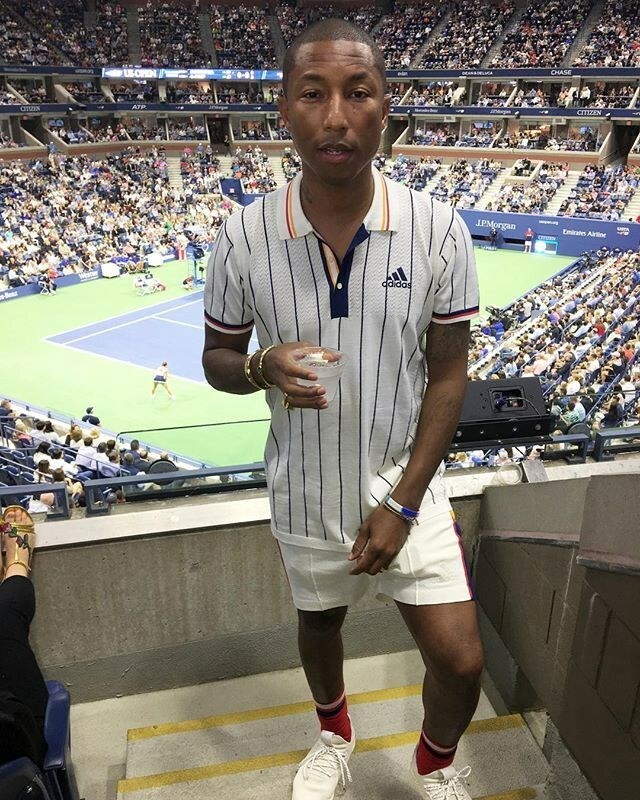 With a partnership to establish a tennis scholarship for kids and a donation to the NYC Parks for a tennis court restoration, Pharrell has used the power of his platform as a vehicle for giving back to the community and “encouraging all to believe in their voices and be loud in inspiring change through love,” according to the official messaging. Here, we talk to Pharrell about the inspiration for the collection, the political message he wanted to drive home, and because we had to ask, his skincare routine. How did the collaboration with adidas come about and why did you want to work on this specific project? But it’s subverted. It’s not so overt. Pharrell: Yeah, because no one wants to be preached to. People love to discover and explore things. This was a great opportunity to push that word. They only word they don’t have in there is the word ‘empathy’ because we need that first. The collection takes a page out of the 70s era golden age of tennis. What can we learn from the players and style at that time that we can apply to today? Pharrell: They just had great swagger. They were super confident. There was a sexiness that they all carried – the men and women. They just knew they were killing it. They knew what they were doing and what they were wearing was sick. Next level. We need that. Not that today’s players don’t have that kind of confidence, but what I’m saying is the way the colourway, the silhouette, the swagger all worked together was very specific to the 70s. I don’t know if you see it in the 80s or the 60s in that same way. The 70s was just effervescent and very vivid. You have had such a long history with fashion, but what does it mean to you, personally? Pharrell: What it means to me personally is the same as what style is. It’s indicative of who you are and what you’re feeling. Specifically, the way I look at it, it’s when I get up in the morning, it’s how I feel, it’s where I’m going, and what the weather’s going to be like. That kind of informs me of what it is that I’m wearing. When people are like, ‘I don’t really have any style, I don’t dress up,’ you kind of are. That’s what your clothes are saying. Where do you look for influences on how to dress? Pharrell: Everyday people. They have the best style, because it’s real. It’s like, the maintenance man, he does maintenance, and so his clothes have a utility function. He’s going to wear it with that kind of swagger, so he shows you how to wear it. When I started wearing trucker hats, maybe 20 years ago, that was because I was seeing truckers wearing them and was like, that’s kind of cool. What designers are you currently inspired by? I know you’re deeply entrenched in the fashion, music and art worlds. Pharrell: Comme des Garçons is always number one for me. (Rei Kawakubo) is the king. There’s always Chanel, I love Phoebe Philo and what she does at Céline. My partner in Human Made, Nigo. He’s the goat to me. What is your favourite thing in your wardrobe? Pharrell: It changes. What would scare me is to have an answer for that, because that would mean I’m stuck. Your collaboration with adidas urges people to “be loud and create a platform for change through love.” What advice do you have for young people to create change in their communities? Pharrell: Try and find ways to empathise and to introduce empathy to people who are resistant to it. That’s very important. You don’t even know how to feel love if you don’t know what empathy is. You really can’t appreciate the sun if you’ve never been caught in the rain. We have to find interesting ways to introduce that notion to people because they’re resistant. Were you thinking about sustainability when designing the collection – did you include recyclable materials? Pharrell: There wasn’t this time, because our main focus was literally just to make sure the players got everything that they needed while we pushed this message of love as much as we could. Sometimes you can just ‘frankenstein’ something so much and it’ll work, but what would happen is that it would take over this conversation. Because sustainability is a whole different domain and something that’s so necessary. I don’t want to get political but it all has the same gravitas and weight and pertinence in our habitat. If there’s no atmosphere, you’re not living. There are just people who make a lot of money on pretending that these are not real issues. I don’t understand how you can live in Alaska and not believe in global warming. Actually, I do understand – a lack of empathy is very powerful. It can make you see things that are not there. What is your manifesto on life? Do you have any words of wisdom that you live by? Pharrell: Appreciation. Gratitude. I’m always giving things because no matter what it is that you do or do not believe in, you do have a life and you don’t have to have it. All of the variables that are in your life, they don’t have to be there. You’ve gotta give things to something bigger than you. This universe is bigger than you and you live in it. So, I give things to the universe. To me, that’s god. That’s a fish saying, I’m good, I don’t need anything, there’s no such thing as water. They don’t know until they get fished one day, that water is real and so is the fishbowl you’re living in, buddy. So you should be appreciative that someone is dropping food in there. Everyone is dying to know, what’s your skincare routine? Pharrell: I exfoliate like a madman. When you exfoliate and you drink a lot of water, that does good for you. To me, the key is just exfoliating, like a monster. There’s a lot of dead skin. All the time. Like a narcissistic madman. Congratulations on the tennis court and giving back to the community. It’s great that there’s a social change component to all of it. Pharrell: That’s necessary, that’s so necessary. You’re the first person that mentioned it today.